Most histories of the struggle against French colonial rule in Vietnam reflect the Stalinist traditions of the Hanoi regime, and ignore or slander the heroic role of the adherents of Leon Trotsky and the Fourth International. 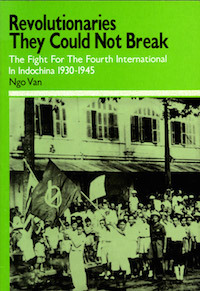 Ngo Van’s book, based on his own experiences as a young Trotskyist in French occupied Indochina (the colonial name for Vietnam, Laos and Cambodia), helps set the record straight. It’s a well-researched, inspiring, but ultimately tragic account. In the 1930s, despite repeated arrests and imprisonment, the Trotskyists built a mass base in Cochin China (southern Vietnam), especially in Saigon (Ho Chi Minh City), leading numerous strikes and winning elections to the city council. As a measure of the mass following they built, a street in Saigon was named after one of the murdered Trotskyist leaders, Ta thu Thau (1906-1945). It was renamed following the unification of Vietnam under the Stalinists in 1975, ”but the Saigonese still call it Duong Ta thu Thau”, explains the author. The Trotskysists faced vicious attacks from the French authorities and the Stalinist leaders of the Communist Party. In 1945, as the Stalinists consolidated their hold on the independence movement, hundreds of Trotskyist militants were massacred, slandered as ”traitors” and ”fascist agents” in a manner reminiscent of the Spanish civil war. To make matters worse, because of their mistaken position of tail-ending Stalinist leaders like Ho Chi Minh – the founder of the Democratic Republic of Vietnam (North Vietnam) – and Mao in China, the post-war leaders of the Fourth International played down the attrocities committed against their own comrades. One of these leaders, Michel Pablo, told the Chinese Trotskyist Peng Shuzhi that, ”compared to the achievements of Mao Zedong’s revolution, the arrest of a few hundred Trotskyists is insignificant”. The brutal realities of French colonial rule provided a fertile ground for the growth of communist ideas in Indochina, in the aftermath of the Russian Revolution of 1917. The first communist activists were recruited among emigres, mainly in France. One of these early recruits was Ho Chi Minh, otherwise known as Nguyen ai Quoc (Nguyen the Patriot) who became a founding member of the Communist Party of Indochina (PCI) in 1929. Ho, unlike the future Trotskyists, remained in exile until the end of the Second World War. He stood on the right within the communist movement, supporting Stalin’s bureaucratic counterrevolution within the Soviet Union and the ”Comintern” (Communist International). Ho’s articles in the communist press stressed nationalism rather than socialism, and even glorified the ”heroes of the Annamite [Vietnamese] race”. Repelled by the crude nationalism of the party leaders, and Stalin’s frenzied chase after alliances with bourgeois governments, a layer of communist militants in Indochina gravitated towards the internationalism and principled class politics of Trotsky and the Left Opposition. This especially after the bloody defeat of the Chinese Revolution in 1927, wholly due to Stalin’s policy of tail-ending the nationalist party, Koumintang (KMT). The Stalinists in Indochina learned nothing from the Chinese experience. They too wanted to strip the anti-imperialist struggle of any social content, refusing to raise demands such as nationalisation and workers’ control of the factories, arguing this would alienate the small native capitalist class. Later, the PCI even dropped bourgeois democratic demands such as land to the peasants, arguing this would alienate the Vietnamese landowners. This popular front approach – unity of both exploited and exploiters on a ‘minimum’ i.e. bourgeois program – was taken to such lengths that in 1941 the PCI transformed itself into the Vietminh, a long defunct nationalist group. The ideological divide between Stalinism and Trotskysim was reflected in two different approaches to party building. The Trotskyists built mainly among the small urban working class and coolies, particularly in Saigon, while the Stalinists, whose leaders were students trained in Moscow, orientated towards the peasantry. In 1930-32, the PCI led tens of thousands of landless peasants and day-labourers in struggle against the iniquitous poll tax of the French authorities, but as Ngo points out, ”could not, and did not try to, launch an accompanying movement in the towns”. The French Foreign Legion responded with massacres of over 10,000 peasants. Despite the movement’s heroism, the PCI leaders made serious ultra-left mistakes. This was during the Comintern’s ’Third Period’ (1928-34): a recoil from the opportunist alliances of the preceding period. Now the ”formation of soviets” and ”seizure of power” were held to be immediate tasks everywhere. As the peasant movement subsided, the PCI suffered merciless repression, including the death from torture of the party’s general secretary, Tran Phu. Of 109 PCI militants put on trial in 1933 for ”plotting against the security of the state”, eight were sentenced to death, the rest receiving a total of 900 years hard labour. In November 1931, the Indochinese Left Opposition was launched by Ta thu Thau and five others. Six months later they began production of a bi-monthly paper, Vo san (Proletarian). In August 1932, 65 members and sympathisers of the Vo san group were arrested for ”subversive activity”. Whereas the mass trial of PCI members generated considerable publicity in France, the Stalinist daily L’Humanité maintained a stony silence over the fate of the Indochinese Trotskyists. In Saigon, however, those Stalinists and Trotskyists still at liberty collaborated, fielding a joint ’workers’ panel’, together with anarchists and a well-known nationalist, in the municipal elections. On the very day that eight PCI leaders were sentenced to death – 7 May 1933 – two candidates from the ’workers’ panel’ (a Stalinist and a nationalist) were elected. The city council itself was a powerless body, but the election had a huge political impact coming in the midst of massive repression. The election of both councillors was invalidated by the French authorities three months later! This episode led to a lengthy period of cooperation between the Stalinists and Trotskyists in Saigon. For marxists, the united front is a practical agreement between mass organisations rather than small propaganda groups. Lenin’s advice was ’march seperately, strike together’ – unity in action, but no mixing of political banners. The Saigon Trotskyists made mistakes in this respect, but unfortunately this is not sufficiently clarified in Ngo’s book. Following the 1933 elections, Thau and the leaders of the Left Opposition extended their alliance with the Stalinists, agreeing to a joint weekly paper, La Lutte (The Struggle), and organisation. In the process, they made impermissible political concessions, agreeing to ”restrict themselves to a paper for the defence of the workers and peasants without broaching the questions of Stalinism and Trotskyism”. La Lutte was to all intents and purposes a joint party, rather than a ’united front’ – a party which lacked a clear marxist program. In the 1935 municipal elections, four La Lutte candidates were elected to Saigon council, two Stalinists, one Trotskyist (Thau) and a Trotskyist sympathiser. Ngo records that, ”the forceful speeches of the four ’communists’ in the municipal council made a great impact and aroused lively popular sympathy as well as raising morale.” The four were arrested six months later for supporting a strike by horse-drawn taxi drivers and, again, their mandates were revoked. These successes notwithstanding, the compromises in respect of program and analysis upon which this work rested were unnacceptable from the standpoint of a marxist organisation. In 1935, for example, the paper was silent over the political bombshell of Stalin’s non-aggression pact with France’s right-wing Republican government. In August 1936, it was silent over the Moscow trials and Stalin’s slaughter of the Bolshevik old guard. Evidently, the Trotskyist leaders thought it possible to seperate international issues from their day-to-day work. Their failure immediately to understand the deadly significance of the Moscow trials, was a warning of events to come – in 1945 the Stalinists introduced the same methods into Indochina. This led to a split in the ranks of the Indochinese Trotskyists, with a minority who opposed the concessions to Stalinism forming the League of International Communists in 1935. This betrayal created an enormous opening for Trotskyism. Belatedly, in December 1936, the Trotskyist majority of La Lutte attacked the Paris government over its failure to lift repression in Indochina. Denouncing this as ”Trotskyisation”, the Stalinists withdrew from the joint organisation in 1937. The split was a turning point in the growth of Trotskyist ideas among the Vietnamese working class. This movement, which led to some far-reaching concessions from the French authorities, saw over 600 action committees spring up over Cochin China, one-third of them under Trotskyist leadership. The Sûreté (French secret police) noted in February 1937 that, ”The influence of the revolutionary agitators favourable to the Fourth International has grown in Cochin China, particularly in the working class milieu of Saigon-Cholon.” In July that year it added, ”The worker element has been won more by the Trotskyist party than by the PCI”. As the Second World War approached the PCI leaders, under Moscow’s prompting, decreed that all questions were subordinate to the struggle against ’fascist’ Japan. They supported the French government when it launched a militarisation drive in the colony, floating a 33 million piastre loan for the ”defence of Indochina” and seeking to conscript 20,000 Indochinese into the French army. Both issues were explosive – there had been a long and bitter history of opposition to colonial military service. This did not stop the PCI calling on people to volunteer en masse to support ”French democracy”. As Ngo points out, ”Some people in the PCI showed such excessive zeal for the loan that they proposed dividing the 100 piastre bonds into coupons of ten piastres and five piastres accessible to the purses of the poor. Others rebelled against collaboration with the colonial regime and were suspended… Our comrades’ declarations took the opposite standpoint to that of the Stalinists: against the imperialist war, against war taxes, against the worsening of living standards”. The Stalinists had so identified themselves with the French authorities and their austerity measures, that when the tax on a box of matches rose by half a cent it became known as the ”Third International box of matches” among workers. The French Governor General noted that, ”While the Stalinist Communists believe… that the interests of the Annamite masses drive them closer to France… the Trotskyists… are not afraid of pushing the natives to revolt so as to turn a possible war to their advantage in order to obtain total liberation”. This venomous hostility towards Trotskyism flowed in part from Ho’s hopes for an accommodation with imperialism, but also from his ambition to become the Stalin of Vietnam. In September 1939, after the outbreak of war, the Communist Party was banned in France and Indochina. Repression of both Stalinists and Trotskyists increased in Vietnam – 1,700 members of the Third and Fourth Internationals were sent to concentration camps. The Stalin-Hitler pact (August 1939-June 1941) had seen yet another u-turn by the PCI leaders, dropping their pro-French agitation and reverting to the ”anti-imperialism” of the Third Period. When Japan landed troops in Vietnam, Laos and Cambodia in September 1940, the PCI launched a reckless and ill-planned insurrection against French rule. Like the peasant rebellion of 1930-32, it was brutally crushed. An internal PCI trial blamed two regional party secretaries for the débâcle and sentenced them to death. Yet despite Ho’s opportunistic zig zags, in the power vacuum created by Japan’s defeat in the war, it was the Vietminh which emerged at the head of the independence struggle. This was due in part to the strengthened authority of the Soviet Union, the decisive political weight of the peasantry in Vietnam, but also due to the mistakes of the Trotskyist parties in the immediate aftermath of the war. As the Japanese empire imploded in August-September 1945, Indochina saw a revolutionary upsurge. In secret talks, Ho Chi Minh had accepted that France would grant independence to Vietnam only after a delay of five to ten years. This was entirely consistent with Stalin’s position, to try to prolong his wartime alliance with US, British and French imperialism. The Indochinese Trotskyists by contrast called for mass demonstrations and the arming of the population to prevent the return of the French colonial regime. In August 1945, outside the control of the Vietminh, 30,000 coal miners in Hongay-Campha in northern Vietnam, set up workers’ councils to manage production. They took control of public services such as railways and telegraph, sacked the old managers and applied the principle of ”equal wages for all at all levels of manual and intellectual work”. This workers’ commune lasted until November, when the Vietminh in the name of ”national unity” arrested the miners’ leaders and imposed a new heirarchy upon the area. Ho’s forces even tried to block the peasantry from taking over the land, although eventually they were forced to retreat on this. 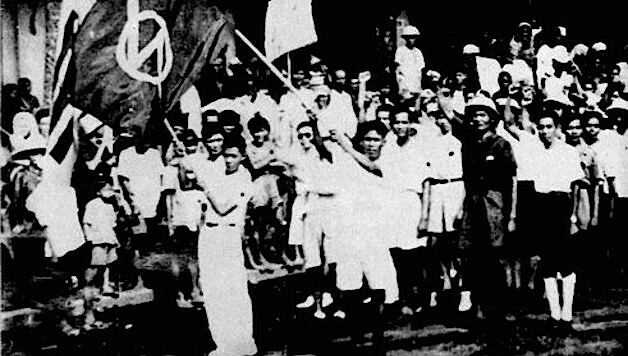 On the first mass demonstration in Saigon, 21 August 1945, in which 300,000 took part, 30,000 marched behind the banners of the Fourth International with slogans like ”Arm the people” and ”For a workers’ and peasants’ government”. While peddling the illusion of a swift and painless victory over the French, the Stalinists sought to obliterate any outlets for independent mass action, such as the workers’ committees. On arrival, the Vietminh seized the central post office, police stations and other public buildings without resistance from the Japanese troops. A new mass demonstration was called for 25 August, this time under Vietminh control, to sanction its seizure of power in Saigon and the rest of the country. More than a million took part in this demonstration with tens of thousands of Vietminh supporters bussed in from the surrounding countryside. This ”so called revolution” was, as one of the Trotskyist leaders put it, ”carried out behind the backs of the people”. Already at this demonstration, Stalinist leaders denounced ”agitators and provocateurs” – a veiled reference to the Trotskyists and the revolutionary workers who looked to them. But in this initial period the Vietminh was forced to tread carefully in its dealings with the Trotskyists. Trotskyist agitation for democratic workers’ and peasants’ committees and the arming of the population had struck a powerful chord among the Saigonese. Unfortunately, in the midst of these dramatic events, the leaders of La Lutte, the biggest Trotskyist force, reverted to their mistaken ’united front’ position from the previous decade, only this time with far more serious consequences. The Vietminh’s putsch in Cochin China had succeeded because in the initial period the masses could not distinguish between its rhetoric about ”independence or death” and its actual policy of backsliding under pressure from imperialism, the Soviet bureaucracy and the domestic landlord-capitalist class. With correct policies and tactics, as a result of the experience of the masses, a powerful revolutionary opposition could have been built up in the ensuing weeks and months. The hundreds of action committees which had sprung into existence had the potential to become an alternative centre of power for the revolutionary workers and peasants of Saigon and its environs – but for this a clear program and firm leadership were needed. But while the La Lutte leaders eschewed cooperation with the smaller ’League’, their entire orientation was towards an alliance with the Vietminh, which in practise meant a Stalinist veto over their own actions. They negotiated, for example, ”permission” to organise a Trotskyist militia, subordinated to the command structure of the Vietminh. Their Annamite language daily, Tranh dau, seems to have ceased publication at this time. Whereas, in the 1930s, the International Secretariat of the Fourth International had taken up the opportunist errors of the organisation in Indonchina, with Trotsky dead (murdered by a Stalinist agent in 1940), the confusion of the Indochinese Trotskyists was only compounded by the mistakes of the international leadership. In the events that followed, the militias of both Trotskyist organisations allowed themselves to be disarmed by the Stalinists without a fight, even when they enjoyed superior force of arms. They rejected – probably fearing the Stalinists’ reaction – an offer of arms and cooperation from the nationalist religious sect, Cao dai, which had a mass peasant following and was itself a target of Vietminh repression. On condition, however, that the Trotskyists maintained complete political and organisational independence from these religious oddballs, a practical agreement relating only to self-defence would have been legitimate. At this time, Ta thu Thau went on a mysterious mission to the north of the country, perhaps to try to meet Ho Chi Minh. He was arrested and shot by the Vietminh. As a result of Thau’s spirited defence in front of the Stalinists’ kangaroo court, the firing squad refused to obey orders and it was left to the ’procecuting attorney’ to shoot him in the back. But as the British moved to dismantle the Vietminh’s fledgling regime in Saigon, the Vietminh – under growing mass pressure – were forced to act. On 17 September they called a general strike which paralysed the city. On 21 September, Gracey declared martial law, banning the carrying of arms and closing down the Annamite press. British soldiers seized Saigon’s prison, freeing the Vietminh’s French prisoners (wartime collaborators), while handing Trotskyist prisoners over to the French Sûreté. On 23 September, British troops accompanied by racist French colonial settlers seized control of the police stations and other government buildings from the Vietminh, triggering an uprising the following night, during which barricades were erected in the city’s poorer quarters. In the pitched battles that followed, the Trotskyist militias, joined by revolutionary Japanese deserters and nationalists, fought heroically. Several hundred Trotskyists lost their lives. The Vietminh, meanwhile, urged the population to disperse to the countryside and, ”remain calm as the government hopes to begin negotiations”. The Trotskyists then, presumably under orders from Vietminh military commanders, also decamped to the countryside, abandoning their positions among Saigon’s working class. In practise, this meant the dissolution of the Trotskyist organisations. In the countryside they were disarmed and, in most cases, slaughtered by the Vietminh. In the events of September 1945 in Cochin China there are analogies with Barcelona in May 1937, where the future course of the Spanish revolution was decided. The Trotskyists in Saigon, despite their key role on the barricades and in the workers’ districts, saw themselves as left critics of the Vietminh rather than an alternative leadership of the Saigon masses. On 2 October a truce was negotiated between the French government and the Vietminh’s area committee for Saigon. At around the same time, the leaders of the La Lutte group were executed, accused of ”giving the enemy a pretext for invading”. As in Spain, the Stalinists directed their blows, not against reaction, but against the revolutionary left-wing and every attempt to advance socialist demands. Vietnam was divided at the 16th parallel, the south under French control and the north under the Vietminh. In the north, Ho Chi Minh accepted the presence of allied troops – first KMT-Chinese and then French – while he tried to negotiate with France. Even after losing half the country, Ho had not given up on negotiations! The Vietnamese Stalinists were eventually rescued from the mess their own policies had created by an event they had neither expected nor supported – the Chinese Revolution of 1949. This social earthquake altered the balance of power in Asia, dramatically raising the political cost of direct imperialist occupation. With the history of Vietnam once again a major talking point, Ngo Van’s book fills an important gap. While it falls short of a thorough analysis of the mistakes of Trotskyist policy and tactics in this period, its description of the baleful role of Stalinism in Vietnam and the Trotskyists’ fight to direct the independence struggle along genuine socialist and internationalist lines is rich in lessons for today.